Make sure you have an active student account. Click here for instructions. The Pan-African Studies Community Education Program (PASCEP) is a low-cost, non-credit continuing education service of the Office of Community Relations. PASCEP has remained a pillar in the community for over 40 years and is the most unique community education program in Philadelphia. With over 25 volunteer faculty members, PASCEP offers a multitude of diverse courses, including Introduction to Computers, Financial Education, American Sign Language, Workforce Development, Rites of Passage, African Drumming, Etymology, Entrepreneurship, Sewing, Reentry Education, Real Estate, Hip Hop, Spanish, and much more. 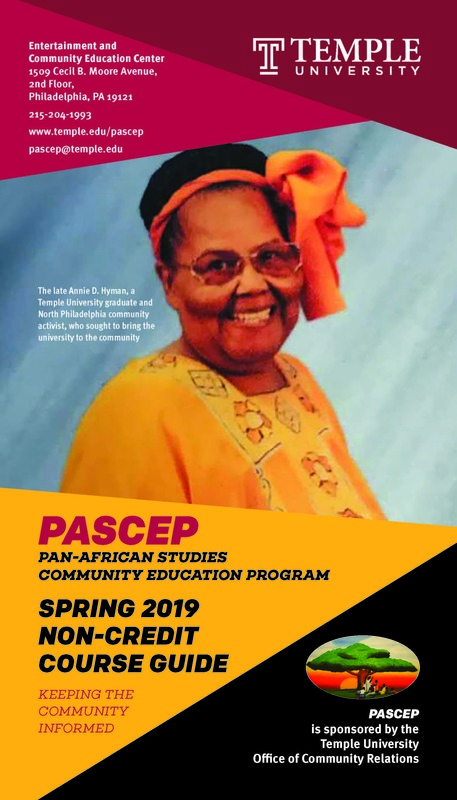 PASCEP was founded in 1975 by the late Annie D. Hyman, a Temple University graduate and North Philadelphia community activist who sought to bring the University to the community. Prior to coming to Temple, the Community Education Program was held in community schools, churches, and centers. University faculty volunteered their time to teach classes. Ms. Hyman later obtained the support of Dr. Odeyo Ayaga, who was then Chairman of the Pan-African Studies Department, to seek Temple University's sponsorship of the Community Education Program. In the Spring of 1979, the University adopted the Program and it came to the campus under the auspices of the Pan-African Studies Department of the College of Arts and Sciences of Temple University. Faculty of the Pan-African Studies Department and other faculty continued to volunteer time to teach courses for PASCEP: Dr. Rita Smith, Dr. Audrey Pitman, Dr. Tran Van Dinh, Professor Sonia Sanchez, Professor Jacqueline Mungai, Dr.Wilbert Roget, Dr. C. T. Keto, Dr. Barbara Hampton, and Dr. Thaddeus Mathis, among others. Today the vast majority of PASCEP's courses are taught by volunteers from the community whose purpose is to give back to others what was given to them in knowledge, skill, inspiration, and example. Community self-help is no better exemplified than in the PASCEP philosophy and practice. You will need Adobe Acrobat, or Acrobat Reader to access this file. A Dialogue in Relationships PASCEP will host effective dialogue between PASCEP instructors, students and interested neighbors. All are welcome. This is a panel discussiong from experts, small business owners and developers to prepare serious mindded entrepreneurs. Sponsored through Temple Univeristy Small Business Development Center and hosted by Lenfest North Philadelphia Workforce Initiative (LNPWI), Pan-Aftican Studies Community Education Program, and TU Center for Community Partnerships. We will explore the civil rights movement and its effect on present academic, economic and social conditions.Learn about new and modified rules, laws, and opportunities that affect Senior healthcare, retirement funds, legacies and taxes. Keyspot: Free Internet access Monday - Thursday, 1p.m. - 5 p.m. except during workshops, Computer basics classes and individual assistance available upon request. Workforce Connection Hub: Collaboration of PA CareerLink, Graduate Philadelphia, Office of Adult Education, and Temple University Human Resources, access to assessment, employment skills, training opportunities, and advancement for post-secondary education, Workshops are offered every Thursday by various partners.